Welcome to the thirteenth issue of the Columbia College Class of 1963 eNewsletter. This evening I went to the Columbia Crew Banquet As we talked of memories of rowing on the beautiful Harlem, I became nostalgic for those wonderful spring days of our youth (and also of those sometimes bitter cold Saturday morning practices in March – like today, when our socks froze in the water at the bottom of the shells). You should be reading this in May, and I hope the weather is glorious, and Columbia has won the IRA. Our Class of 1963lunches continue to welcome a steady flow of our classmates. You should plan on joining us. As I mentioned last newsletter, if it's your first visit, I'll buy you a drink. (What an offer! )The next few dates are March 9, April 20, and May 11 June 8. As always, you can join us in the Grille Room at the Columbia Club, 15 West 43rd Street at 12:30 PM. Please join your classmates for an informal lunch at the Columbia Club every second Thursday of the month. It is our hope that these gatherings will renew old friendships and foster improved relationship with our class and the College. This month, Thursday, March 9, 2006. The thirteenth Second Thursday Class of 1963 lunch was held on February 9. Several of the regular Second Thursday Club members showed up, including Larry Neuman, Bob Heller, Tom O'Connor, and Paul Neshamkin. 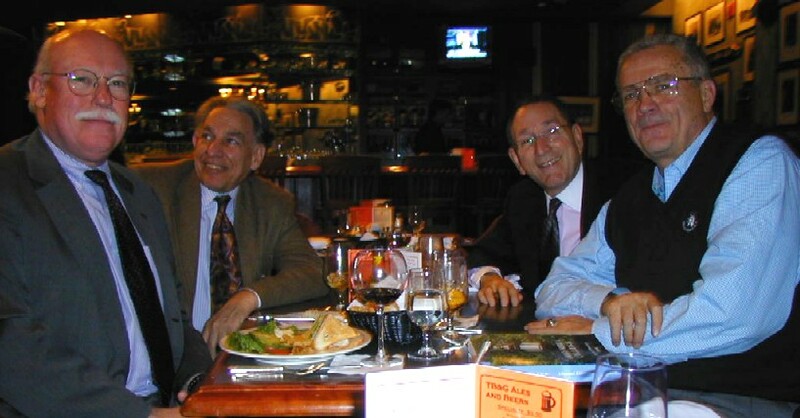 (From left to right) Paul Neshamkin, Larry Neuman, Bob Heller, and Tom O'Connor. I hope you can all join us (please encourage your friends to come with you) at the next lunch on Thursday, March 9. Let me know if you will attend so that we can reserve a big enough table; RSVP to Paul Neshamkin (pauln@helpauthors.com). Peter Gollon responded to my plea for news about a recent trip he took but only to say, "Sending anything to newsletter re: Costa Rica trip will have to wait until I return from a business trip to Hong Kong. Leaving tomorrow for 8 days. I did learn to schedule enough extra time there that I will have several days off to explore, and to go to Macau for two nights as well. Also, I switched to digital photography, and now have to sort through 600 photos to find the 10 good ones. That job is harder with digital, both because the number of photos taken increases and the job of comparing them on-screen instead of with prints is more difficult." Barry Austern writes, "Now for the story of my life after Columbia: I got a MS in Biochemistry from NYU and then a PhD in that same field from the University of Massachusetts in Amherst. In 1968 I married Susan Levin and she is still stuck with me. We have one daughter, Heather, who is 31 now and married, no grand kiddies. In late 1969 I came to Cincinnati to take a job with the US Dept. of Interior. In 1970 that was reorganized as part of the fledgling EPA, where I remained until I retired in 2004. NYC is a bit far for me to come to the monthly lunches, so I'm sorry I can't join you." Ira Malter writes, "After 40-plus years outside the Metro area, I have relocated to Port Jefferson in Suffolk County as Director of Mammography at St .Charles Hospital. My wife, Cynthia, is planning to open an Art Gallery. Would love to reconnect with my classmates. "